Glo Pillow Wakes You Up Gently | OhGizmo! I like things that glo. I hate waking up. Maybe if I had one of these glo Pillows I’d get up in the morning feeling neutral instead of murderous. The foam pillow works as an alarm clock, and an internal grid of LEDs begins to glow about 40 minutes before it’s set to wake you up. The idea is that a slow and gentle increase in light will bring you out of sleep more naturally. Sounds good in principle, but I hope it has some kind of emergency photonic disruptor mode that kicks in after I pound the snooze button for the twelfth time. 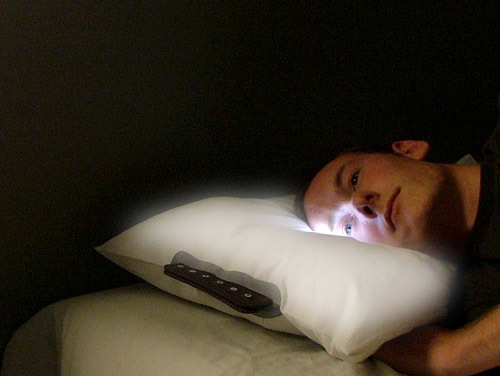 The glo Pillow is currently just a prototype, but it picked up one of Time Magazine’s Best Inventions of 2007 awards, so I’ve got to assume that it has a production future. It’s a very good idea about glowing pillows, Naturally we wake up when light falls on our eyes so its possible to wakeup early and also we have many types of pillows which I browsed can also help you out.